Edward de Vere Earl of Oxford reportedly died on June 24, 1604. WHITTEMORE: It did not require any such conspiracy, in the same way that the public never knew that Marilyn Monroe swam in the White House pool or that FDR had to use a wheelchair. In any case, the poet of The Sonnets left behind him some very clear statements about his authorship. Sounds like he was trying to tell us something! WHITTEMORE: Not the writer “Shakespeare” but, rather, Shakspere of Stratford, who seems to have been unable to write even his name and was, in fact, a money-lender. 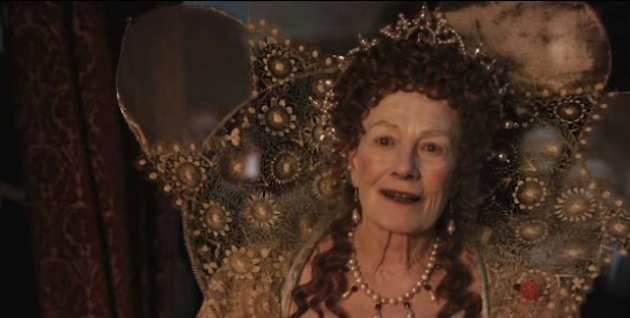 WHITTEMORE: The film portrays Elizabeth as not knowing that Oxford was her son. As for her being wantonly promiscuous, I’d say she’s portrayed as a healthy, sexually active woman. I’d say that is not “troubling” at all. Next to what we know about her father Henry VIII, she comes across as amazingly normal — especially since she was an absolute monarch. WHITTEMORE: Do you mean the way, for example, Arthur Miller writes The Crucible about the Salem witch trials in order to comment on the McCarthy hearings? Do you mean the way Hamlet inserts lines in a play to catch the conscience of the king? Do you mean the way Shakespeare writes Henry V to inspire national unity? Do you mean how the skits on Saturday Night Live often make fun of, and comment upon, our politicians? WHITTEMORE: That’s nonsense about only then finding his true calling; on the contrary, the film portrays him as having written his works (the first versions of them) much earlier, for the Court of Elizabeth. At least six of the plays are performed by the Queen’s Men in the 1580’s – plays of royal history, during wartime – prior to the appearance of “Shakespeare” in the following decade of the 1590’s. WHITTEMORE: So? At that time there was no internet, no CBS News, no CNN, no Saturday Night Live, no newspaper or radio – the stage was powerful; it was the media. WHITTEMORE: Reductive? Why not admit that knowing the biographical and historical background of a play might expand our understanding of the work? WHITTEMORE: I realize how tempting it may be to believe that Oxfordians must be snobs; and to believe, therefore, that what we really want is for Shakespeare to have royal blood. The fact, however, is that I don’t know any of us who thinks that way. WHITTEMORE: The only price will be the need to drop all the fantasy written over the past two or three centuries. WHITTEMORE: If you’re unable to tell your students why, sooner or later they’ll tell you. To which one might a very long list of other things, as well as point out as the anti-Stratfordians have known for decades but which one could never learn from Contested Will, that what Justice Stevens has termed the “imaginative conspiracy” (long before Shapiro split the phrase into two pieces to serve a rather narrow agenda) was in full swing by the late 1590s. Lots of people knew de Vere was Shakespeare and said so in one or another oblique way. Shapiro and those think like him may prefer to ignore this evidence, but I would venture to say that more and more people in coming months and years will chose rather to noticethan to continue repressing it. “Lots of people knew de Vere was Shakespeare and said so in one or another oblique way.” Just out of curiosity, has anyone discovered any non-oblique way? A letter or a diary for instance in which someone mentions de Vere having written a specific “Shakespearean” play? I believe de Vere was the author, but I figure there must be at least one written reference by someone somewhere linking de Vere to his works. Yep, those are good examples. And there are many more. My favorite is the work Detobel and Ligon did on Francis Meres. I see that many Stratfordians are still citing Meres as definitive evidence for their own theory. I would predict that as knowledge flows through the channels of the internet, such arguments will gradually disappear. It is dangerous now for Stratfordians to draw too much attention to Meres. He is a boomerang. I don’t mean to be rude, but I hold with those who believe that Shakespeare is Shakespeare and I would like to reply to a few of your points. Most datings of the plays put them much later than you do. For a variety of reasons, including pieces of text that seem to refer to current events (cf. Macbeth and the Gunpowder Plot), many of them have been specifically placed after the death of Edward de Vere. I understand that the standard Oxfordian riposte to this is that de Vere actually wrote all the plays, and some were released after his death, edited to appear current. I don’t find that persuasive because I can think of no motive for it. Whatever the case, citing unorthodox information on the dates of the plays from a specifically pro-Oxford text is surely not fair play. Regardless of the authorship question, not even the makers of “Anonymous” can say the film is entirely truthful. The director, Roland Emmerich, admits in interviews that details like the writing of “Midsummer” when de Vere is 9 and de Vere’s later affair with Queen Elizabeth are false, part of creating a cinematic mood rather than documenting history. (If memory serves, screenwriter John Orloff DOES claim the whole script to be factual.) Historical films usually take some liberties with fact — this is to be expected — but in this case the liberties are rather large, and for a film that already faces a good deal of automatic skepticism, the decision not to hew closer to history is perplexing. If de Vere wrote the sonnets, there was no reason for him to hide it. Playwriting MAY have been inappropriate for a noble of his stature (though I am not sure of this — some of the Earl’s peers wrote court masques for Queen Elizabeth), but the writing of poetry certainly was not. Sir Philip Sidney is an excellent example of a high-ranking courtier whose poetry was accepted and influential. Coincidentally, Sidney also wrote at least one court masque. To summarize, I don’t see a strong motive for de Vere to conceal his authorship, and without that motive, evidence such as the name references in the sonnets and the traditionally accepted dates for the plays persuasively indicate Shakespeare as author. Again, I’m not trying to troll or be rude — just to have a conversation! Not writing poems in itself is what was ever so dangerous. But his son (and the son of the queen) chose not to enter the Burghley-world, but to support Essex. The first 17 sonnets are urging Henry to marry the Burghley-girl. But later de Vere from behind the curtains began to support the Essex-line, too. On the eve of the fatal rebellion, resulting in the execution of Essex, and the years-long imprisonment of Southampton, the theaters in London played from ‘Shakespeare’ II.Richard. After about half year the queen burst out, making it clear that she did know, II. Richard was actually she. Do you see it a bit clearer? I hope so. Hank has made a really great job. Read The Monument, you’ll understand even much more. Thank you for posting this. Was very interested to see how your debate would go, as have been doing all my reading on the topic from second hand sources as far as discussion panels go.